This entry was posted in Battersea Power Station and tagged application for review, battersea, Battersea bulletin, Battersea Community Group, Battersea Forum, Battersea history, battersea its past its future, battersea park, Battersea Power Station, Battersea Power Station Community Group, battersea redevelopment, Battersea Society, Burger Bar, Chelsea Bridge, Chelsea Cruise, Coffee Stall, demolition, heritage, industrial Battersea, Keith Garner, kiosk, Nine Elms, NLE, northen line, Northern Line extension, queenstown road, Sime Darby, Snack Wagon, Susan Ekins, Tea Stall, Tincknell, Urban, Urban Sprawl, Vauxhall Nine Elms Battersea Opportunity Area, Vito, VNEB, wandsworth council by Kayleigh van der Heide. Bookmark the permalink. I and most of the Residents of Battersea and from far afield absolutely deplore that Wandsworth Council and the rich want to revoke the licence of the Chelsea Bridge stall.It has been there as long as I can remember,and my parents use to take me there as a child coming out of the Funfair,then later on stopping there During the Chelsea cruise in the 70’s.Its Part of Battersea History and Gradually the History of Battersea is Dissapearing.Come on Wandsworth Council lets keep some of Battersea History for our Children.. I am writing to express my support to maintain and NOT close the kiosk near Chelsea Bridge. I was born and grew up in Battersea and there are many landmarks and iconic buildings that the borough is famed for and should be rightly proud of. Many of which have featured in movies and on television. So what does Battersea mean to people who picture up images of it? I can’t name them all, but here is a few. The park – a truly wonderful open space, the Dogs Home and clearly with recent TV exposure this has been elevated to world fame …… so how can I make that comment? Well I now reside in Rotorua, New Zealand and people here watch the show and talk about it. The power station that has sadly remained idle for some considerable time with the constant promise of someone snapping it up and turning into residences, commercial / retail outlets, recreational facilities etc. Then comes the kiosk. The kiosk is an icon. It is unique. Don’t throw away a unique classic. Preserve and respect it. It is a huge part of Battersea history and it has served and united generations both local and non local. I was talking to a friend who currently lives in Weybridge on the telephone tonight. We were talking about change. I mentioned the proposal and desire of some to see it closed. Her immediate response was, “Oh no. I know that, I’ve been there. It’s famous.” Just proof that it is not just Battersea die-hearts who want to keep it. It’s not people who don’t want to see a single change. We all accept change happens but this is a ridiculous proposal. If the kiosk goes, I suggest your next mission is to to remove all London post boxes as they are icons too and you clearly have no respect of our heritage. My friend & I used to frequently use the coffee kiosk on Chelsea Bridge when visiting Battersea Park in the late 50’s onwards. It evokes lovely memories every time I pass it. 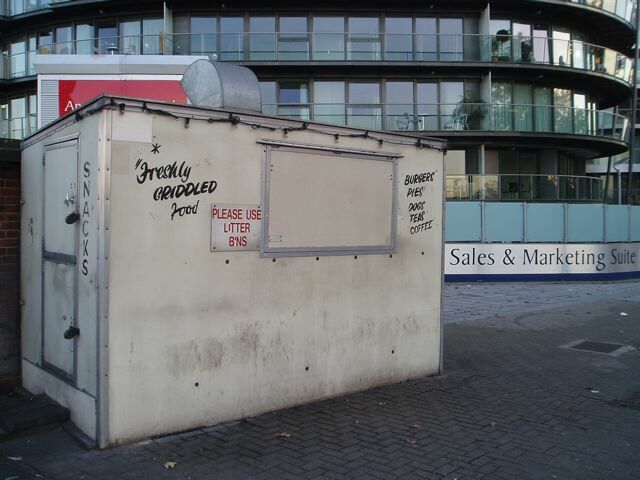 I am appalled at Wandsworth Council’s reasons for wanting the kiosk closed because in the many thousands of times I have passed the site I have NEVER seen rubbish strewn by its customers, nor heard noise other than from the traffic, be it during any hour of the day or night. The only disturbance I’ve witnessed is from the new building’s security guards who object to the kiosk being there because it doesn’t appeal to their residents… If it doesn’t appeal, why on earth buy a place close to it, imbolsils! 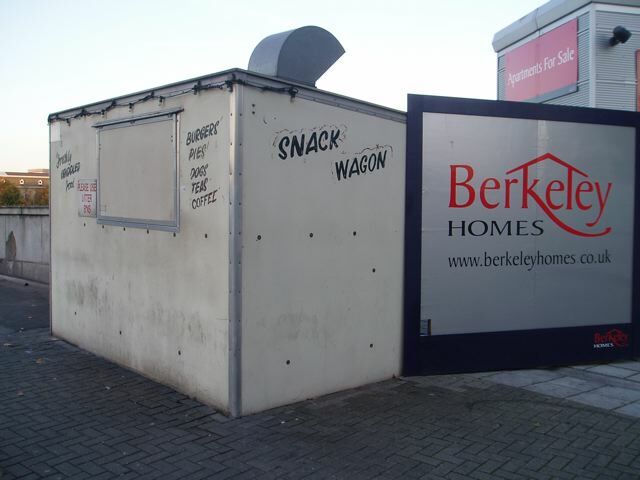 The only reason Wandsworth Council want to revoke the Kiosk’s licence is because it ‘doesn’t fit in’ with their ideals for the area & the new residents don’t like it – Another form of social cleansing opportunity… To appease all, why don’t Wandsworth Council build a new Kiosk, at the same spot of course, for the owner, or better still, the wealthy residents could all chip in, problem solved!!!! i have been using the tea stall since 1970 when i worked at Battersea fun fair. every morning i got my pie and tea from dave when it was a red four wheel wagon up until the fair closed down, then i started using it again when i was a van driver, i had to stop using it about four years ago when i got a ticket though the post for parking outside the stall. it would be very sad to see it close. My great grandfather Joseph Andrew owned the coffee stall on Chelsea Bridge on the ground of the LBSCR. He died in 1909 and this stall and two others he owned were left to my great grandmother. The point is the stall has been there alot longer that 70 years 115 years at least, such a shame if it were to go. Thanks so much for your comment re the Battersea coffee stall on Chelsea Bridge. We would really like to interview you about this if you would agree. It would help to save the stall. We could do this at a time and place at your convenience some time in the new year. Please get in touch via bps@spectacle.co.uk if you think this is a possibility.